You have a digital multimeter. It’s rated at 10 A max, but you would like to measure a current at about 30 A. How is that possible? Good news is that by using Ohm’s Law you can circumvent such limitation! 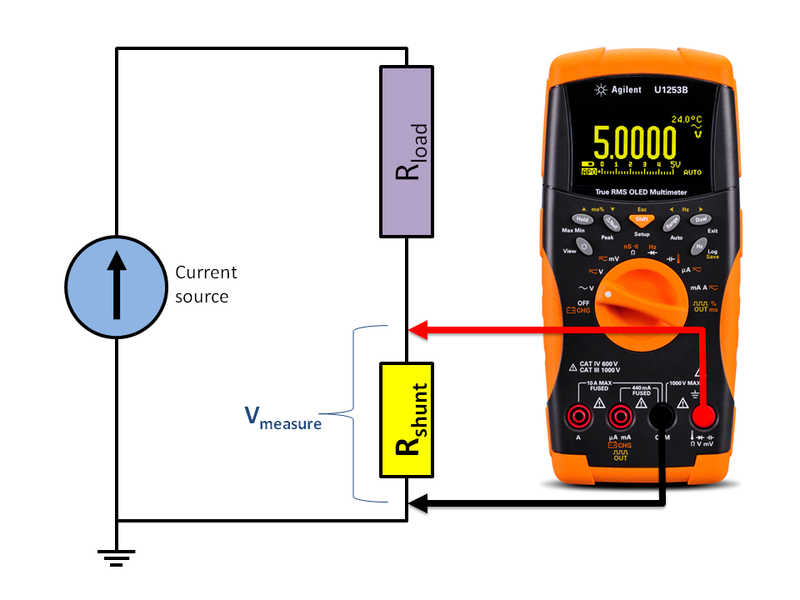 Ohm’s Law describes the relationship between voltage (V), current (I) and resistance (R) in the form: V = I x R.
This article will talk about how we can perform such measurement and also how to verify that our instrument is capable of handling such a task by using real examples. Some good practices and precautions will also be mentioned here. 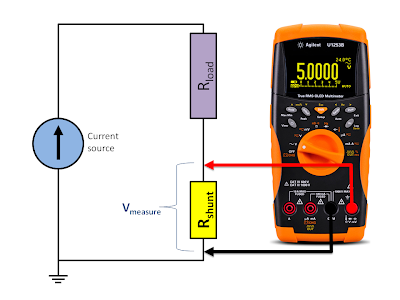 With just a slight manipulation of that equation, we can obtain I = V / R, which indicates to us that we can also derive the value of the current measurement if we know the voltage and resistance. From this, we observe that the current is inversely proportional to the resistance. So, if we could fix the resistance to some value using a resistor, we could then measure the voltage across that resistor to obtain the current. This resistor should be of a very small in order not to disrupt the circuit. This is termed as the shunt resistor and is placed in series with the circuit load as shown in Figure 1. Figure 2 - Image of CS-50 shunt resistor from Ohm-Labs. CS-50 is a 0.01 Ohms shunt resistor with a 0.5 V output at maximum rated current of 50 A. Notice the fins in Figure 2? That's a heat sink to regulate the temperature on the resistor as things can get pretty heated up during operation. This 0.3 V is definitely within the safety rating of the Agilent U1253B which is 1000 V. This proves that by using shunt resistors, we can measure current (30 A) that are greater than the maximum rating (10 A) of the multimeter. As an illustration, Table 2 below shows some values of Vmeasure as we vary the Imeasure at a resolution of 0.1 A about our target current value of 30 A. 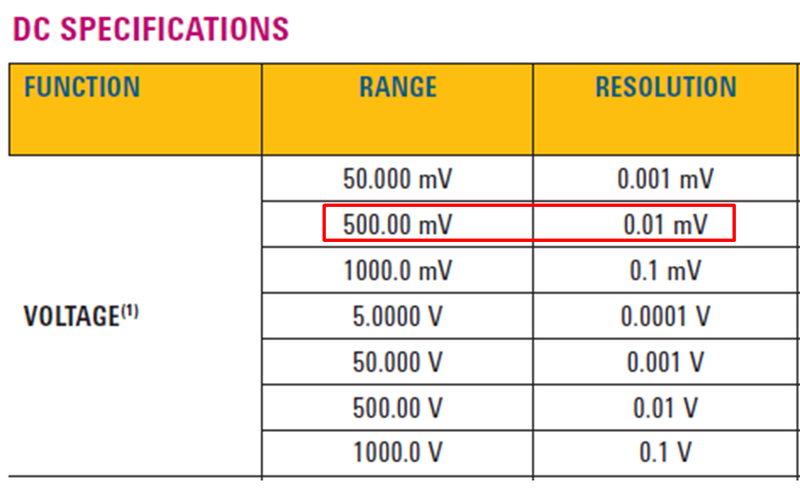 Notice that with every 0.1 A step of change, the voltage also change with a step of 1 mV or 0.001 V. This table is also useful to help convert the voltage measured to the corresponding current value. Referring to the datasheet of the Agilent U1253B under ‘DC Specifications’ section (see Figure 3 below), we zoom in on the 500 mV or 0.5 V range as our measurement falls within this and find that the resolution is 0.01 mV. This means that the Agilent U1253B is more than sufficient to resolve a 1 mV change. Good to see this helpful article. 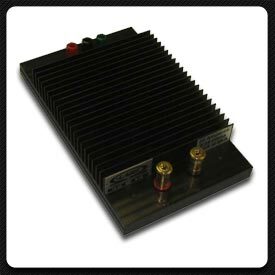 Found some nice info on shunt resistor from Here.